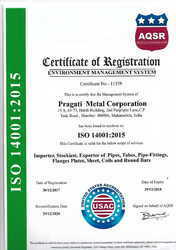 Established in the year 1977, Pragati Metal Corporation is one of the noticeable enterprises highly engrossed in Manufacturer, Supplier, Retailer, Wholesaler, Trader, and Exporter of Aluminium and Stainless Steel Products. Our offered products such as Stainless Steel Fittings, Brass Products, and Aluminium Products. These products are made under the direction of dexterous executives at our clients end to retain their consistency and superiority at the destination of our clients. Using finest class basic components along with modern machinery, these are made as per the set industry guidelines in line with the advancements taking place in this arena. Also, all our products are tested thoroughly before finally getting dispatched to retain its quality while shipment. Backed by nimble and dedicated personnel, we have been able to carry out business associated processes in a trouble-free manner. This personnel is designated after intense market research on the base of their qualification, abilities, experience, and capability. These personnel works in close sync amid each other, our crew targets to take the success of the enterprise to next level. Due to our clear dealings, principled business policies and easy payment modes, we have mustered large patron-base across the country. We conduct numerous learning programs and training sessions for this personnel in order to improve their knowledge and skills. Under the trained leadership of our mentor Rahul Shah, we have been able to withstand a leading reputation in the market. We have acquired a huge client base across the globe due to supreme quality products. Manufacturing and Trading of Aluminum and Stainless Steel Products. A highly advanced infrastructure is boosting our brand competency, as we have invested a substantial amount in constantly upgrading our work set up. Our in-house manufacturing units are strategically designed to synchronize the technological advancements with our production operations. Besides, our infrastructure comprises of hi-tech testing and distribution divisions that empowers our team to fulfill varied tasks within the agreed time frame. We take pride of the vigilant sagacity of our expert professionals, whose commitment underpins our business strategies to become a client focused and service-oriented group. We believe that our worldwide success is laid by their passionate approach to set benchmarking standards. We have gone from strength of R&D to the influential product quality that assures cost competitiveness, which indeed helped us to create a huge client base across the globe. We believe that quality is the lifeline of every business and we are committed to satisfy our customers by supplying quality products. We have proactive approach to uphold integrity in conducting our business and provide conducive environment for individuals to perform and excel in their areas of operation. Our ultimate motto is customer satisfaction. Our company was founded on the ethos of pioneering, and the objective has been attained with the passion and dedication of our diligent team members, who strive to excel in their areas of operation. Our people are industry’s best professionals who are putting their best efforts to set highest possible standards in the competitive global industry. We have highly experienced R&D scientists, manufacturing experts, trained workforce, skilled quality controllers and assiduous distribution personnel on board. The real success of a business is not just a healthy balance sheet but also the way it conducts the business and the core values imbibed in its system that creates a benchmark for others to follow. Pragati Metal Corporation is one such company in the Indian steel industry who has pioneered many firsts to carve a niche for itself in the highly competitive steel industry. Having established ourselves and set up in the heart of India’s commercial center Mumbai, we have built up adequate stock levels of all essential items within our scope of supply and are in a position to offer immediate deliveries. In the event of non-availability of any specialized items, we are confident that we will be in a position to export the same at short notice, and you will be served by a team of dynamic young entrepreneurs. Under normal circumstances, we would be in a position to arrange deliveries in your expected time. We have been participating in major infrastructure and industrial government projects of India & abroad, we are a client focused and service-oriented group. The foundations of our business heritage continue to be based on quality, reputation, customer service and performance. The highest emphasis is placed on human resources and deployment of the latest in information technology. To meet the challenge of success in highly competitive and changing markets, we are investing in human resources. Highly trained and experienced team of professionals equipped with the latest in information technology, coupled with company’s financial strength, allow our group to present innovative solutions and services to our customers.